AIR GAUGES & GAUGE PANELS. COMPLETE BRACKET & BAGS KITS. ONBOARD & AIR SOURCE KITS. 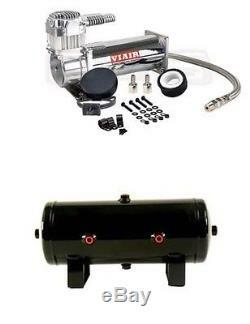 Viair 444C Single Chrome Compressor + 2 Gallon 6 Port Tank Air Ride Suspension. 1832 Lone Star Rd, Mansfield, TX 76063. This listing is for a brand new Viair 444C Single chrome Compressor and a 2 Gallon 6 Port tank. This package is suitable for those who want to add one more compressor with a small 2 gallon tank to their existing air suspension system or want to install a small train horn or operate tools etc. You can use this system to manually inflate your air suspension or load support bags. The average fill time for a single 444C from 0-200 Psi with a 2 gallon tank will be between 3-4 minutes or less. Following items are included with the Viair 444C Single Chrome Compressor. One 200 Psi Chrome Compressor. Tank is stamped with max 150 Psi Pressure. Just enough to lift most vehicles. When you have almost no room, this may be your savior! Dimensions: 6" Diameter x 17" L X 7.5 High. Red Oxidized Coated Interior to resist Rust. Port Location: One 3/8 Port on each side. 2 1/4" Port on face, 1 1/4" Port Top and 1 1/4 Port on Bottom of the tank. Distance between the mounting holes is approx 10. WARNING: This product can expose you to chemicals including lead, which is known to the State of California to cause cancer and birth defects or other reproductive harm. Newmatics Inc is a family owned company, established in 2008. We are authorized dealer for all major Air Suspension companies in USA. We sell only major brand name authentic, 100% genuine parts. We are located at 1832 Lone Star Rd, Mansfield, TX 76063. We will answer your question or concern within 24 hours. International Customers (including Mexico & Canada) - Please Note. We cannot under-value merchandise or mark the items as a gift on custom forms & Invoices. This is against US and international laws. Please make sure, your address information is correct and up to date. All return items must be authorized and approved by us. Your feedback is very important for us. We will definitely resolve it. You can leave us a voice message, someone from our staff will get back to you same day or within 24 hours regarding the help and assistance needed. The item "Viair 444C Single Chrome Compressor + 2 Gallon 6 Port Tank Air Ride Suspension" is in sale since Wednesday, November 30, 2016. This item is in the category "eBay Motors\Parts & Accessories\Car & Truck Parts\Suspension & Steering\Lower Kits & Parts". The seller is "newmatics" and is located in Mansfield, Texas. This item can be shipped worldwide. California Prop 65 Warning: WARNING: This product can expose you to chemicals including lead, which is known to the State of California to cause cancer and birth defects or other reproductive harm. For more information, go to www.P65Warnings.ca.gov.